I fell in love with Lisa Shearin's Raine Benares series at the tail end of last year. Shearin's delightful blend of wry humor, high-speed action, and brief moments of sizzling chemistry make for highly enjoyable reads. The only problem being that they end leaving you thirsty for more. 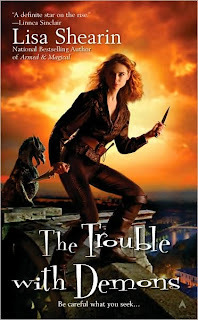 The Trouble with Demons is the third Raine Benares book and has my favorite cover (and title) so far. This girl looks more like the Raine in my head and the title is certainly...apt. There are demons galore in this one. Demons pint-sized, demons ogre-sized, demons every color of the rainbow, oh my! Raine is tired. Just last week she and her goblin more-than-friend Tam narrowly managed to foil a slew of elven assassins and now this week the demons are coming out of the woodwork. Turns out a Hell Gate has been opened, a demon queen is in search of her husband's captive soul, and the acting archmagus would love to see Raine take the fall for the entire debacle. Meanwhile, the Saghred still has its hooks in Raine's soul and the wards the Guardians have placed on it seem unable to hold its power in check. And, for better or worse, Raine finds herself drawn inexorably closer to both Tam and Mychael as the three of them are forced to combine their respective powers in order to try to stem the flow of demons and close the Hell Gate for good. I remain amazed at how much punch Lisa Shearin can pack into such a short period of time. Like its predecessors, this story spans barely a week's time. And somehow at the end you feel like the characters have grown and changed and fulfilled your expectations. I am hoping for a little bit larger chunk of time in the next one, as it just seems like the story has grown too large by now for such short installments. But we'll see. I continue to be very fond of Raine and I love the fact that, though they are polar opposites and disagree vehemently over a girl, Mychael and Tam are friends. They understand and respect each other. Tam particulary is able to see beyond himself to make painful decisions for the greater good. That may be the fact that I Am Team Tam All The Way talking, but I categorically refuse to believe he will have a relapse and/or give in to his dark past. Nope. Not gonna happen, my friends. And while he may have his sights set on Raine, he knows how to be her friend. He's good at that. I do find myself concerned as to how these three heroes (because that's what they are) are going to maintain the uneasy alliance they've formed as tensions only look to be rising for the foreseeable future. And along with that I worry about the triangle drawing out indefinitely. Triangles start to make me twitchy after three books. So sue me. Interestingly, for an author so good at slam-bang action, Shearin proves herself quite adept at crafting a quiet moment or two between her characters. Moments where the banter stops and the pauses are pregnant. In which you as the reader find yourself just aching for them. I cast my vote for a few more of these. Also, more Talon. The kid is pure awesome and never fails to crack me up. These are good characters. I have such hopes for them. I have this one at home and I'm torn between wanting to read it right away, and putting it off because I know there's going to be a year wait for the next one. Honestly, though? I'm seriously lacking in willpower and will probably pick it up soon. I can't wait to see what's up with Raine! "These are good characters. I have such hopes for them." < I love this Angie, it tells me how much you appreciate them. I understand the feeling. Ana, oh girl, read 'em. Put 'em at the top of the pile. GOOD stuff going on in them. Thank you so much for your wonderful review!! I'm so glad you enjoyed TTWD -- and thank you for posting your review on bn.com! Ana, you must find the time. I think you would be charmed by these characters. Lisa, you are so welcome! I'll drum up the good word for you anytime. Thanks for stopping in. Amy, my pleasure! They are a hoot and a half. I just finished reading this one too, and I completely agree with your review. I'm constantly in awe of how MUCH Lisa can cram into these books and never seem draggy (although I do think poor Raine deserves a mini-break from the constant helter-skelter action). TEAM TAM ALL THE WAY! :p Although unlike most triangles, I actually like both guys. Sigh. How long until book 4? Thea, yeah. I am forced to admit Mychael the White is a good guy. And now that that's off my chest, GO TEAM TAM! So much for willpower! I just finished it. And finished re-reading a few key sections. And now? I want more! Chelle, I know! That scene with Raine and Tam at the end...just give me more of that. Please?